Long Lifetime in Extreme Conditions! 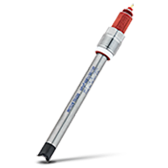 Refillable pH probes are the optimal pH sensors for extreme conditions. In combination with pressurized housings, these sensors will succeed in extreme applications where others would fail. They can provide significant savings on replacement electrodes when properly maintained. A patented silver-ion trap prevents sulfides from poisoning the electrode, and the ability to refill the electrolyte means sensors can last for years. Sterilizable For Use With SIP and CIP! Hygienic pH probes for sterilizable applications are ready-made for use in applications where clean-in-place (CIP) and sterilize-in-place (SIP) processes are frequently performed. They can withstand the high temperature and quick media changes of these processes and still perform accurately without maintenance intervention. Accurate Performance in Harsh Conditions! 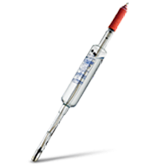 These durable pH probes are made for the harsh conditions found in chemical production. In this family, you'll find pH sensors that perform at the high pressures and high temperatures associated with chemical manufacturing. Models within this category are Ex-certified for use in processes in Ex-classified zones. Simple pH Measurement in Low Conductivity Water! pH probes and sensors have a difficult time measuring in low-conductivity water found in power plant cycle chemistry and microelectronics manufacturing applications. Until recently this required a measurement sensor, a reference sensor, a temperature sensor and a flow bowl. 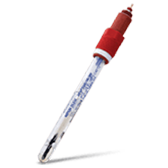 This is no longer necessary with the right selection of pure water pH electrodes.